Racing Tips: Do Professional Gamblers Need Luck to Win? Do Professional Gamblers Need Luck to Win? Very few gamblers get to the point of winning money. Even fewer win money on such a regular basis to be termed a professional gambler. It is a tricky way to make a living. Few people appreciate the amount of time and effort it takes to get anywhere near the point of realising the ''dream''. Becoming a professional gambler is a popular topic of conversation with many fascinating stories of winners and losers. While many punters have ambitions to leave their job and change it with being a pro gambler - few achieve this goal. The stereotype of a man dressed in a trenchcoat, walking around the members' enclosure at Goodwood racecourse. A chiselled jawline leads to a mouth which speaks equine truths stuffed with a Cuban cigar which puffs out clouds of expensive smoke. In one of those big pockets sits an even bigger wad of cash. Perhaps that was a reality in the good, old days prior to this computer age. Legendary gamblers such as Phil Bull or Alex Bird. Names synonymous with the archetypal professional gambler detailing a glimpse of an envied trade. In the mind of many, they are still kings of the betting ring. A place where imagination and nostalgia flicker like a projected black and white film. Today's pro gamblers are more likely than not to be found sitting in a quiet room, laptop on the desk, using betting exchanges to place bets manually or by bots which work quicker than the human mind. However they work, it is a different world. Times change, evolution sees a different kind of beast. Much has changed but the gambler's mindset - those foundational principles - do not to any great degree. 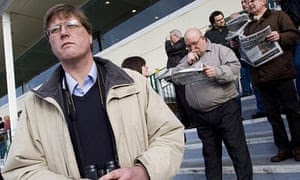 It will never be an easy task to beat the layers whether they are bookmakers, a reclusive character sitting in a room, a man controlling a drone flying high in the sky above a random all-weather course. Whoever, whatever, knowledge is power. You may win because you know something or lose because you don't know enough. But what about the luck part. Does luck play a part in the gambler's profit and loss? From a knowledge perspective, luck has nothing to do with your potential to beat the bookmakers. Without hard work and knowing more than most it is very unlikely you will win money gambling. Lady luck can fill your pocket with cash for a short time but unfortunately, you can't buy a season ticket at any price. Long term, those averages find a middle ground of good and bad which resembles your average punter sitting in a bookmakers shop. They hold an image in the mind of Alex Bird but the mindset, knowledge and understanding of someone who needs to try harder. Luck can play it's part in any horse winning and losing. A myriad of factors from a blind being removed a fraction to slow to the site of a horse breaking down in the dying strides of a race. In turn, those who placed bets: one happy to win, one disappointed, if not enraged, by an unfortunate loss. If you ever need a touch of luck, it is when you have a potential big win. A bet to win a few grand or several hundred. I know which horse I would rather have the luck of the devil and scrape home by a nose. Knowledge is power but sometimes a little bit of luck can see a gambler win big.